Home » Happy Birthday Derek the Cleric! Updated 17:48PM, Sunday March 3rd, 2013	by The Editor, Christian.co.uk Be the first to comment! That my flock at St.Cliff’s has never quite hit triple figures was all the encouragement I needed to launch myself onto the ‘blogosphere’ and to see if I could achieve an ’online’ congregation that would make me the talk at the local ministers’ fraternal. 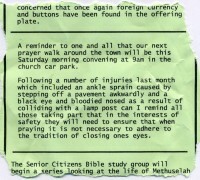 I will confess that whilst there is much talk of church unity within the town, when push comes to shove, it is every man (or should I say minister) for himself. It was indeed a feather in my metaphorical cap when I secured a publisher for my ‘online’ ramblings and I rather felt I knew how it must have been for a certain Mr. Pepys when his regular jottings pertaining to ye olde London town hit the shelves. 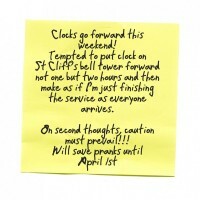 Whether the minutae of life at St.Cliff’s has quite the lasting appeal as his immortal diaries, only time will tell. 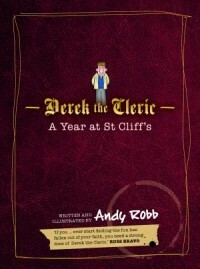 You may be asking yourself what precisely does ‘A Year at St.Cliff’s’ (for that is the title of my tome) contain within its rather attractive, spot-varnished and embossed cover (I fear I am not very good at this sales promotion malarkey) and what good reason is there to part with my hard-earned cash to purchase a copy of the aforementioned tome? A good question and one that I will answer by proffering a sneak preview of a little of its content in the hope that you will be duly swayed and the coffers of St.Cliff’s ubiquitous Roof Fund will be swelled by the resulting increased royalty payment. As if that were not enough I have had the good fortune to secure the kind endorsements from the odd Christian ‘celebrity’ or two. To discover their identity you will have to splash out on the book by ‘clicking’ on the helpful link below. Should you wish to join my ‘online’ congregation and to journey with me on a regular basis simply make a beeline for my wondrous web site www.derekthecleric.com and where you can also find out how to follow me on Facebook, Twitter and my veritable ‘blog’. What the next three years will serve up, only time will tell.